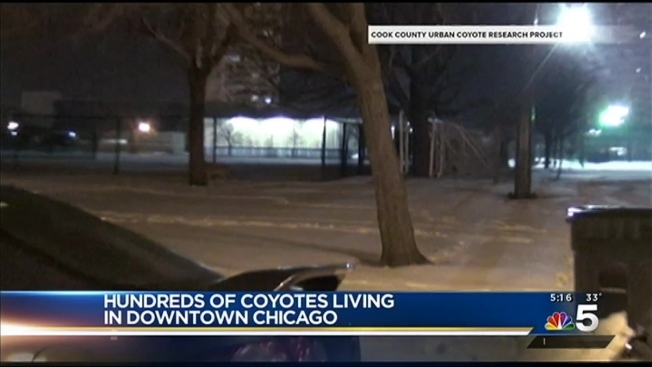 Researchers say hundreds of coyotes are right at home living in the concrete jungle that is downtown Chicago, having learned to understand some traffic patterns and how to move in the shadow of night. "They wouldn't be able to live down here if they didn't learn which roads are most dangerous, which one aren't, and how to use traffic lights," said Stan Gehrt, an Ohio State University professor specializing in coyote research in Cook County. For nearly 15 years, scientists have trapped, tagged and monitored nearly 900 coyotes to gain a better understanding of the urban canine habits. National Geographic's "crittercam" has given humans a fascinating point-of-view into their movements. The Chicago coyote population has increased ten-fold since the 1990s, scientists said. And while their country cousins are most active during the day, Chicago coyotes are said to be almost completely nocturnal so as to avoid human contact. The Cook County Urban Coyote Research Project maintains data about coyotes in the region at UrbanCoyoteResearch.com.